This is the moment you’ve all been waiting for. We reveal the final results of Quadrophilia and award the title, “King of the Quads”. The video below gives you all of the information you need delivered in video form by three happy judges who have been drinking some of the best 10-11% abv beers in the world for a couple of hours. If you don’t have 10+ minutes to spare, jump ahead to the text below the video where I count down all of the beers entered in the contest from bottom to top, with brief descriptions of each beer. This beer has a bubble gum aroma on the nose, like you might find in a Hefeweizen, without the banana or clove. In that sense it falls in the La Trappe school, but it was too boozy, too sweet, and did not have much in the way of redeeming dark fruit character. This is the only beer of the ten that I would not gladly buy again. With some aging it may improve. This beer has all of the characteristics of a strong, dark Belgian beer (dark roasted malts, dark fruits, chalky yeast) and the alcohol is well hidden, but in terms of bold flavors and mouthfeel it falls a little short of a quad. 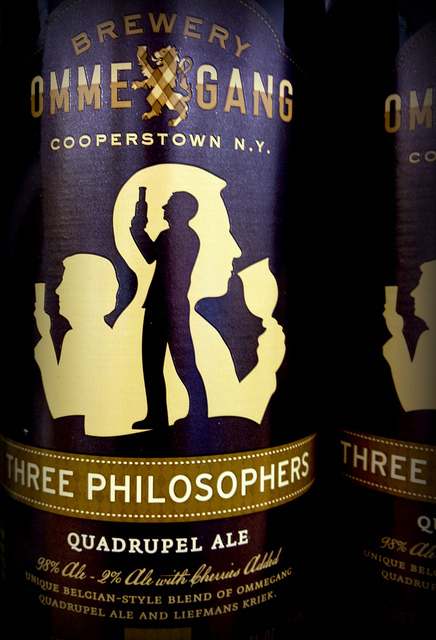 That makes a lot of sense because this beer is not sold as a quad and is probably closer to a dubbel. Nevertheless, at $5 a bottle it is a great value, just not a serious contender to be named the world’s best quad. 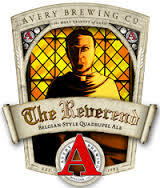 Of the all the beers in this contest Avery’s The Reverend has the most rich caramel and butterscotch character from the malts. There are also vanilla highlights and just a hint of lighter fruits in the taste and nose. Unlike the Weyerbacher the alcohol is nicely hidden. 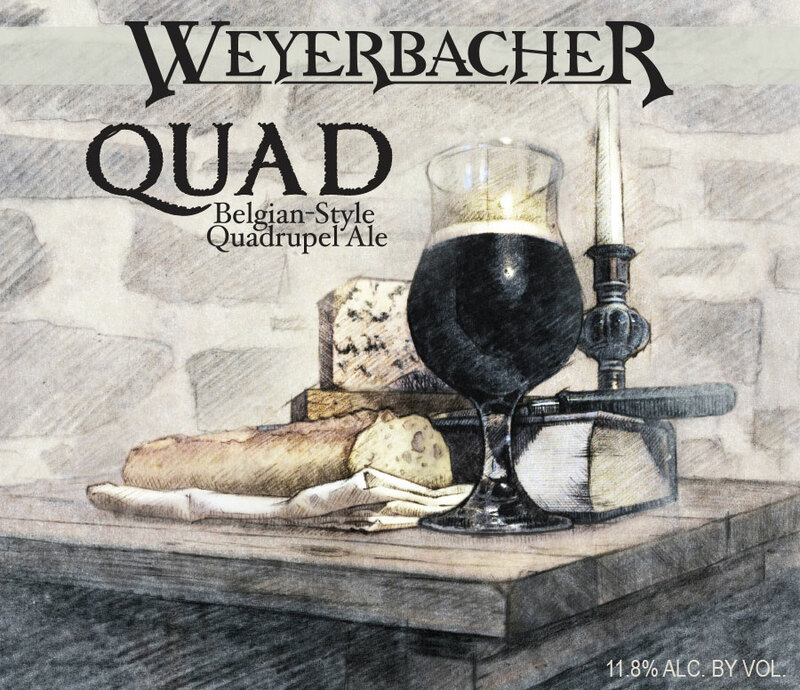 This is another American Quad that seeks to emulate the La Trappe style, quite successfully in this case. The addition of 2% Liefman’s Kriek makes this beer distinct from all of the other entrants. There is cherry on the nose but not so much in the taste. This beer was less malty and drier than any of the other quads we tasted. It does not have the big dark fruit character that most of the Belgian Quads bring to the table, but it does have the creamiest mouthfeel. It’s a unique take on the style and a tasty beer in its own right, but in our opinion it doesn’t quite measure up with the best from Belgium. The first word that comes to mind when you drink a Rochefort 10 is raisins, there is also some molasses and yeasty goodness, but make no mistake that dark fruits are the star of the show. There is considerable carbonation that keeps the beer from becoming too thick and syrupy, no simple feat for an 11% abv/300 calorie beer. Rochefort 10, St. Bernardus Abt 12, and Westvleteren XII are all similar to each other, all three classic examples of the style. Even in a blind taste test it is easy to pick these three out from the others, but it’s somewhat intangible what separates the three beers from each other. Nevertheless, in round 2 all six judges picked St. Bernardus over Rochefort, and in the final round two of the three judges picked Westvleteren over Rochefort. 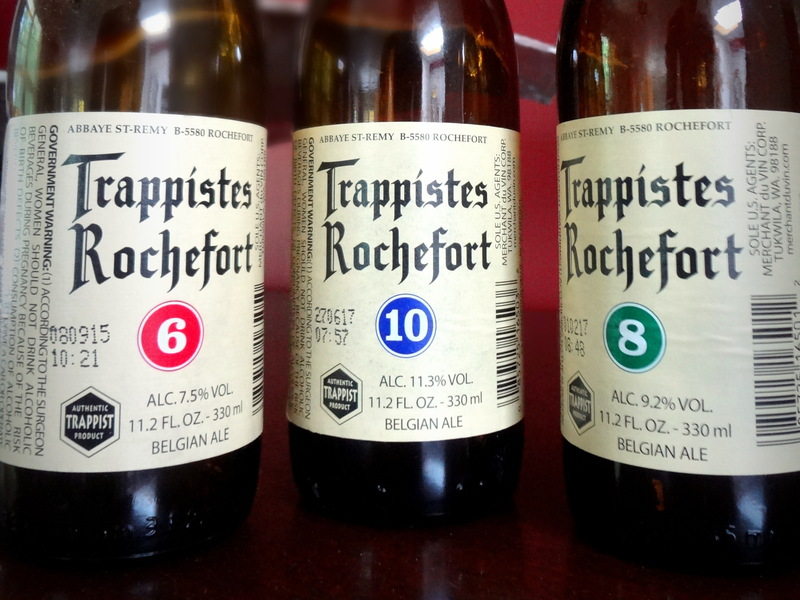 It is worth noting that in both cases the Rochefort we were drinking was only 6-7 months old, while the other beers were about a year older. That may help to explain the general sentiment that Rochefort didn’t hide the alcohol quite as well as the other two. 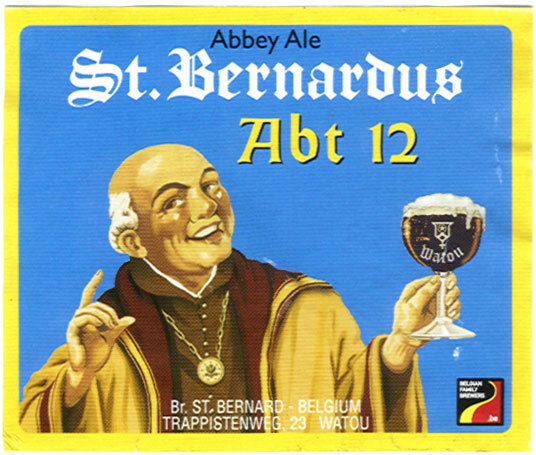 As documented earlier in this series St. Bernardus Abt 12 is brewed with the old Westvleteren XII recipe and in terms of taste it is probably the closest facsimile to the Westy 12. Raisins, plums, figs, brown sugar, vanilla, honey and Dr. Pepper were all adjectives used to describe the taste and aroma of this beer. Although similar in pedigree to the Westy 12 you can tell the difference between the two. This beer is distinctly different than the other Belgian Quads. There is roasted, caramel-like maltiness along with Hefeweizen-type notes of banana and bubble gum on the nose. The caramel richness of the malts comes through in the taste along with accents of lighter fruits (peaches, apricots, bananas). There are enough hops to keep things from becoming too sweet and the alcohol is very well hidden. Spicy, black pepper-like phenols emerge at the finish. This beer was quite different from the other Trappist quads and an eye opener for me. I was surprised when the identities of the beers were revealed and the Tröegs Mad Elf finished this high. It has a clear deep amber color like the La Trappe and there is quite a bit of alcohol on the nose, but not very much in the taste where it really counts. For a beer brewed with cherries there is surprisingly little fruitiness to this beer. It tastes like the yeast has been allowed to ferment nearly all of the sugars to alcohol. 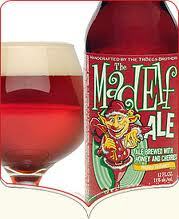 Whereas La Trappe had notes of banana and bubble gum on the nose, Mad Elf has cloves. For a big beer Mad Elf has an amazingly clean finish that does not leave much lingering on your tongue. Chocolate flavors from the roasted malts are masterfully blended with a big helping of dark fruits (plums, prunes, figs), and accented with spices (particularly cloves). The raisin character that is so typical of Belgian quads is present, but less dominant than in either the St. Bernardus or the Rochefort. To top it all off it has a silky smooth mouthfeel. This beer tastes like you took a St. Bernardus Abt 12 or Rochefort 10 and mated it with your favorite stout. It shows that you don’t have to be a Trappist Brewery to make a world class quadrupel ale. Part of me is reassured that the top rated Quad in the world was able to beat off all challengers in a blind taste test and emerge as “King of the Quads”. Another side of me is a little disappointed to admit that this beer, which is so difficult to find, is truly better than the other nine beers which I can purchase without too much trouble. Westy 12 is similar in taste to the Rochefort and St. Bernardus, but there is something intangible that imparts more pop and liveliness. It’s hard to put your finger on what makes it better. I found it to be more aromatic, and there was a higher level of spiciness (black pepper, clove) from the phenolic byproducts of the yeast. Ted and I both felt the malts, dark fruits, spiciness and alcohol were exquisitely well blended. Chris was less impressed because he felt the alcohol was a little too dominant (and correspondingly ranked it behind the Rochefort and Pannepot). What have we learned. 1. 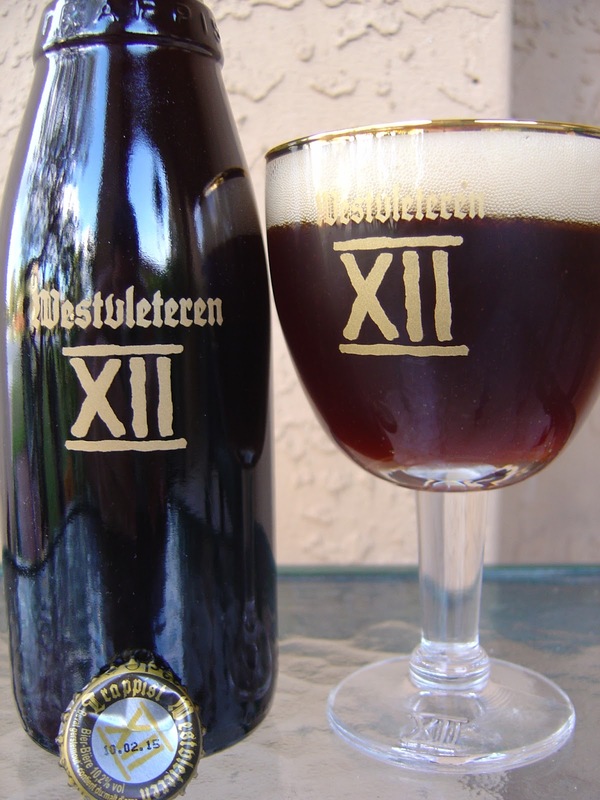 Westvleteren XII is definitely a world class beer worthy of trying if you get the chance. 2. For those of you who don’t live in West Flanders, St. Bernardus Abt 12 and Rochefort 10 are the closest, readily available, stand-ins for Westy 12. 3. If you are a fan of both quads and stouts then Pannepot is the beer for you. 4. 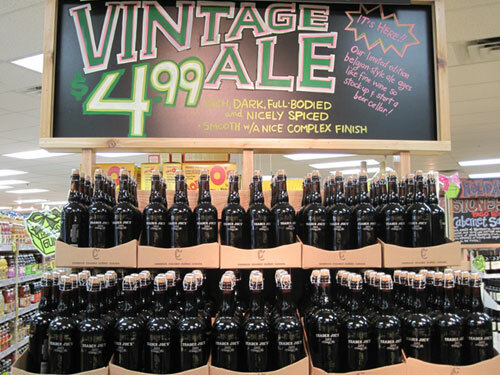 At $15 per six-pack Mad Elf may seem like an expensive purchase, but on a per ounce basis it’s a steal for this underrated beer (only the Trader Joe’s Vintage Ale comes close). 5. 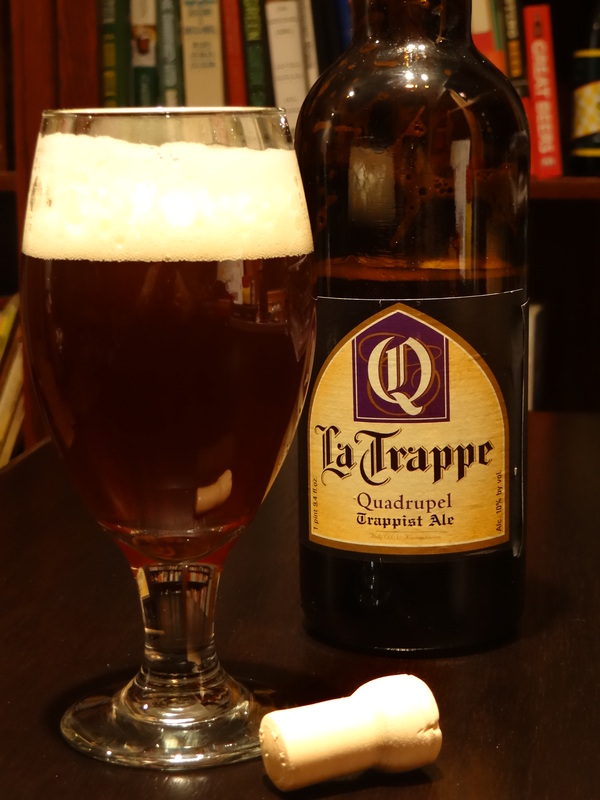 La Trappe Quadrupel is delicious in a different way than its Trappist brethren. It reminds me of a cross between an English Barleywine and a Hefeweizen. If you’ve tasted and compared these beers I’d love to hear your thoughts. Please leave a comment below. If you are like me and cannot get enough quads, I’ve got some good news for you. 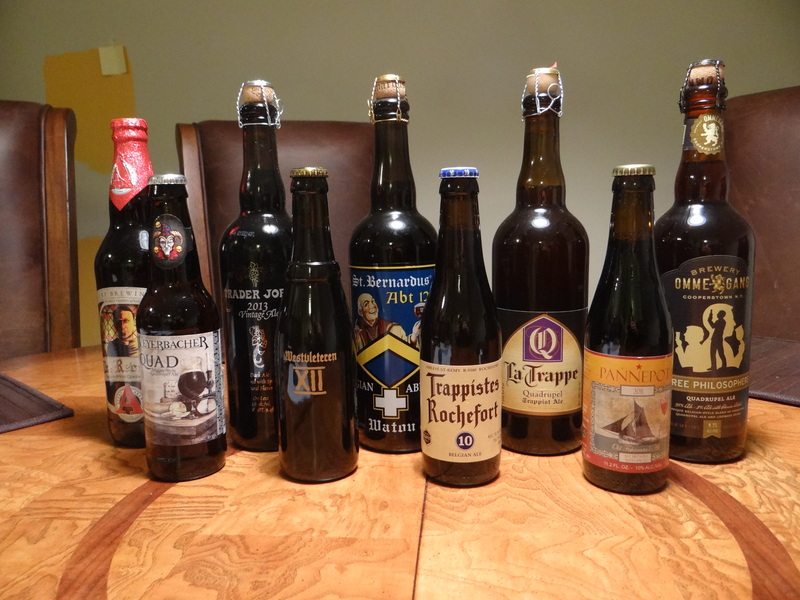 This was so much fun that we have decided to have a supplementary round of tasting where we review quads that were left out in the first go around like Chimay Blue, Gregorius by Stift Engelszell, Ovila by Sierra Nevada, and two Canadian entrants La Terrible by Unibroue and Rigor Mortis by Dieu de Ciel. Click here to see how those beers stack up against the ten quads discussed above. Personally, my top five quads would go as follows: 1) Rochefort 10, 2) La Trappe Quad, 3) Westvleteren 12, 4) St. Bernardus abt 12, 5) Chimay Blue. I do however, want to try the Pannepot. I just can’t seem to find it. Those are all really good beers so it comes down to personal preference in the end, although I will say the La Trappe Quad is really a different beast than the others. Before I did this contest I would have thought Rochefort 10 would come out ahead of St. Bernardus, but on two different occasions that was not the case. If you ever try them side by side in a blind test be sure to come back here and let me know how it turned out. Great competition Pat! Belgian quads are definitely my favorite style of beer. 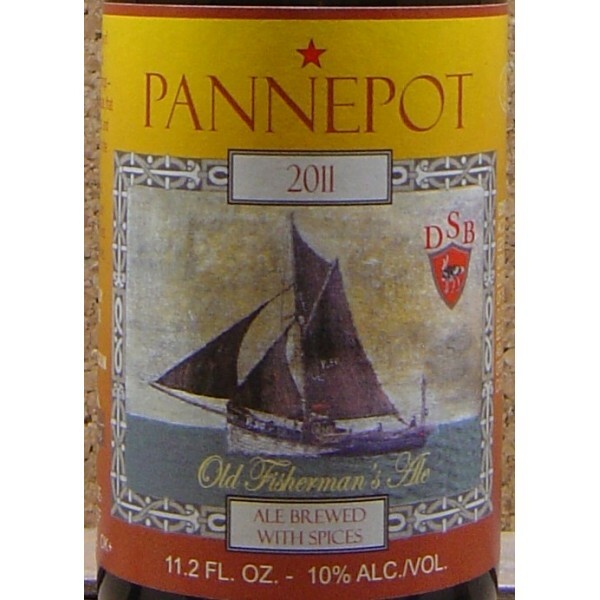 I went looking for the Pannepot as it’s the only one I haven’t tried, but couldn’t seem to find it here in Maryland. Where did you manage to find the Westy 12??? I honestly can’t bring myself to drink the Westy 12 I have been aging since I know how difficult it is to find. I thought you might like this series. Glad that you saw it. I bought two bottles of the Westy 12 from Mike Lufaso who picked up his 6 pack in Jacksonville. It was sort of a lucky coincidence. I know what you mean about having a hard time drinking it, but I would say that it is very bright and delicious right now (our beers being nominally the same age). So I’d have one sometime in the next month or two and take notes. If you have more you can drink one per year and compare them. How many do you have left? I had another quad tasting session this past Friday to try some that got left out of the competition. I’ll write up a post on it soon, but I can give you a tip on two that are right up there with the best – Rigor Mortis abt by Dieu du Ciel (out of Montreal) and Gregorius by Stift Engelszell (a newer Trappist brewery in Austria). So if you’ve not tried either of those I would recommend seeking them out. I’m going to be in DC at the end of February for an NSF Panel. Would you and Jenni be interested in meeting up and a great beer place? It would be the last Friday in February. In terms of beer places in DC, do you have any places in mind to meet up? I know of a few places with good beer, but I’m not as familiar with DC as Baltimore. We could research it. There is a place called churchkey in dc that is on the list of 100 best beer bars in the country, although there are two in Baltimore the brewers art and Max’s tap house.